In the summertime, it’s so nice to be able to eat outdoors and share a meal with friends. And cooking on the grill makes it even nicer, since it reduces clean up at the end of the night. 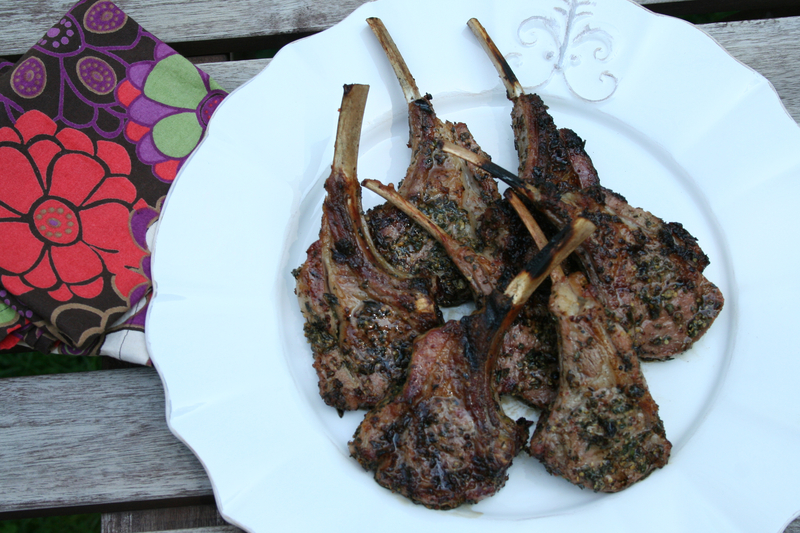 These herbed lamb chops are a great appetizer. You don’t event need cutlery – just pick each lamp chop up, like a little lamb lollipop. Or double the quantity to serve as a main, along with some roasted potatoes and grilled veggies – all on the BBQ of course. Combine all herbs, mustard, salt and pepper, garlic and olive oil to create a marinade. Use a dish with a lid or a re-sealable plastic bag. Add lamb chops. Massage lamb chops to evenly distribute herb marinade. Allow to marinate in fridge for at least one hour, but can also be left overnight. Spray or oil BBQ grill. Preheat grill to medium-high heat. When grill is hot, remove lamb chops from marinade and place onto hot grill. Grill each side 3-4 minutes until medium rare. Remove from grill and allow to rest 2-3 minutes before serving. This recipe was developed for the Summer 2010 issue of Cottage Life magazine, as part of an advertising feature for Sawmill Creek Wines.